Code requirements for minimum levels of effective thermal resistance in wall and other building assemblies depend on climatic conditions and the type of energy source used for space heating. -* Effective thermal resistance values of common building assemblies are provided in the Model National Energy Code for Houses. It is available from the National Research Council. -» Wider spacing of framing members reduces thermal bridging and provides higher effective thermal resistance. Use insulating sheathings in place of structural sheathings to increase the effective thermal resistance of wall assemblies. -* Take into account the effect of thicker building assemblies when design ing details at the foundation wall/main floor and wall intersection, and at the wall and roof intersection. Additional consideration should also be given to factors affecting the amount of latjour associated with various insulated wall assemblies, particularly in relation to the placement of air and vapour barriers. adequate bracing to resist lateral loads and keep the wall square. Others, such as rigid glass-fibre, polystyrene or polyurethane board, will not. In this latter case, the wall should be reinforced with a diagonal wood or metal bracing let into the studs. The complete wall sections are then raised and put in place, temporary braces added and the bottom plates nailed through the subfloor to the floor framing members (Fig. 42). The braces should have their larger or flat dimension upward and should permit adjustment of the vertical position of the wall. 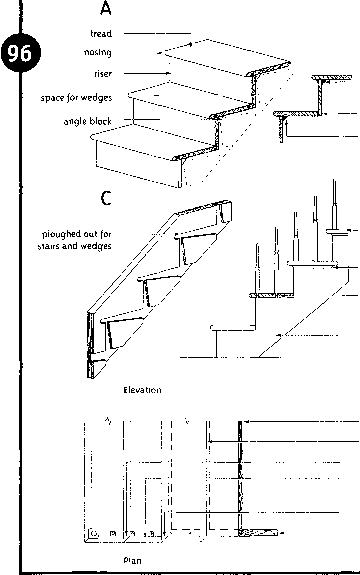 Wall framing used with platform construction: (l) top plate end-nailed to each stud with two 3 "A in. (82 mm) nails; (2) top plates nailed together with 3 in. (76 mm) nails 24 in. (600 mm) on centre; (3) stud toenailed with four 2 1/2 in. (63 mm) nails or end-nailed to bottom plate with two 3 'A in. (82 mm) nails; (4) top plates at corners and loadbearing partitions are lapped and nailed together with two 31/4 in. (82 mm) nails or the plates are butted together and tied with a metal plate fastened to the top plates with three 21/2 in. (63 mm) nails on each side of the joint; (5) doubled studs at openings and multiple studs at corners and intersections nailed with 3 in. (76 mm) nails 30 in. 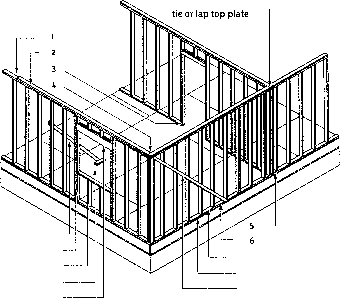 (750 mm) on centre; (6) bottom plate nailed to joist or header joist with 3 1/4 in. (82 mm) nails 16 in. (400 mm) on centre.